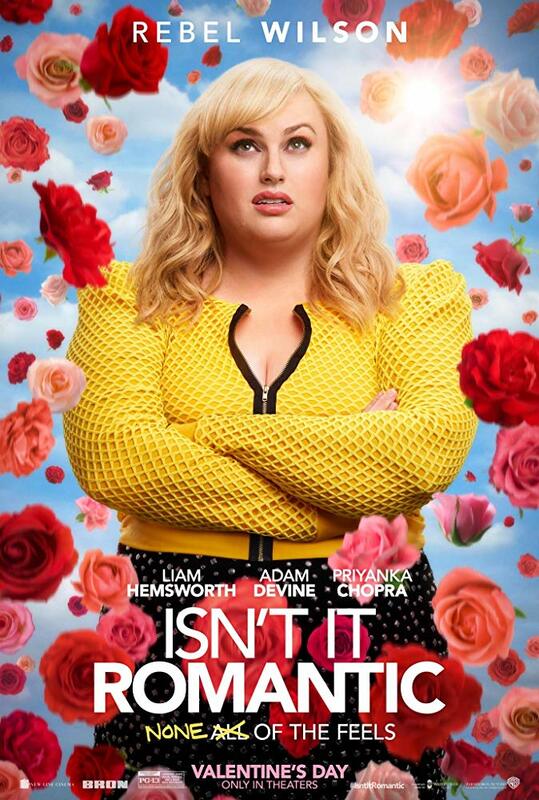 After a mugging goes wrong, Natalie (Rebel Wilson), who is disenchanted with love, finds herself trapped inside a romantic comedy. Isn’t It Romantic is absolutely delightful. It clearly states all the typical rom-com clichés at the beginning when Natalie is being rather cynical about the genre, and then once it becomes a rom-com, it has so much fun with those clichés. It treads the fine line of poking fun at those clichés but still embracing them when the right moment comes. Rebel Wilson is great as Natalie, she’s charming and funny and has great chemistry with all of her co-stars. When Natalie wakes up in her rom-com life, Blake (Liam Hemsworth) who had previously not known she existed, can’t take his eyes off of her. Hemsworth looks to be having a lot of fun being a typically hot yet potentially self-centred love interest while Adam Devine’s Josh does well of not falling into the nice guy/friendzone trap. Josh and Natalie are best friends, and believable ones at that, and their friendship is so sweet and Josh never acts like Natalie owes him anything which is great. The soundtrack is full of so many great throwbacks to rom-com movies. The way Vanessa Carlton’s “A Thousand Miles” is used is pure brilliance and there’s so many other songs that reference other rom-com movies, in many ways Isn’t It Romantic is like a love letter to the genre. The fun thing about Isn’t It Romantic, is that while it follows the typical story framings of a romantic comedy, it also has a feel-good message about loving yourself and being happy. Isn’t It Romantic is sweet, funny and it’s a film that leaves you with a big grin on your face. It’s a great way to spend 90 minutes and it’s the right balance of fluffy and satirical. 4/5.